A dense, chocolate cake highlighted with bourbon makes this a grown up chocolate dessert. 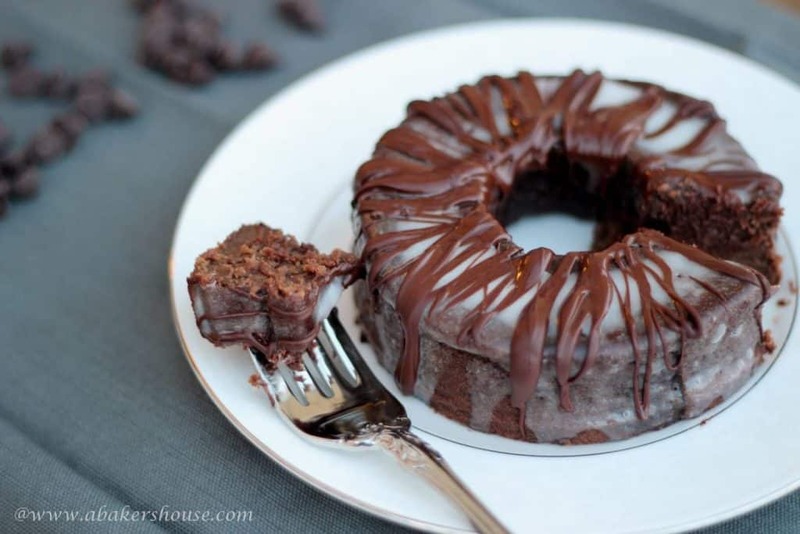 Top with a glaze AND a drizzle of chocolate to take this Chocolate Bourbon Mini Bundt over the top! 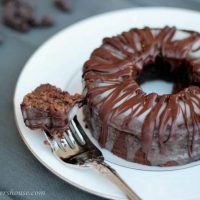 The inspiration for this Chocolate Bourbon Mini Bundt recipe comes from Family Circle for their Chocolate Bourbon Cake I intended to change the shape slightly by using a mini Bundt pan. Little did I know that I’d make the recipe my own through a mistake: I cut the recipe ingredients in half to fill my three small Bundt pans…but I neglected to cut the liquid measurement in half. The Family Circle recipe states that the batter will be thin, but the batter I made was so thin that it resembled something closer to chocolate water rather than chocolate cake batter. I added some flour and kept going, putting the Bundts in the oven and hoping for the best. And with a bit of luck, these cakes turned out to be something I’d want to make again! Do not expect a fluffy cake, this creation is a dense chocolate cake, close in texture to fudge. The bourbon taste is present in an obvious way, yet it is tempered by the chocolate and espresso so that it is not overwhelming. The icing glaze topped with a chocolate drizzle finishes this dessert with flair. I do think I’ll try Family Circle’s recipe again, following it line by line. If you try it, let me know. For now, though, I am eating my way through this pretty cake and plan to use the second two mini Bundts for cake truffles which would make sweet Christmas gifts for friends and neighbors. Do you like chocolate cakes? You’ll love these recipes too! Decadent mini Bundts are perfect for any celebration! Preheat oven to 350 degrees F. Prepare mini Bundt pans with baking spray and dust with cocoa powder. In a medium saucepan combine the water, espresso, bourbon and butter. Heat until the butter melts then take off heat and whisk in the sugar. Cool slightly. After the liquid mixture cools for 5-10 minutes, whisk in the egg and vanilla. Add the flour mixture right into the saucepan, whisking continuously. Pour into the Bundt pans and bake for 30 minutes. Cool on a wire rack for 10 minutes then invert the cake. Cool completely. Glaze: Combine the confectioners’ sugar, corn syrup and milk. Whisk until smooth. It helps to put the small cakes on a wire rack sitting over a parchment or foil lined baking tray. Pour the glaze over the cooled cake. Allow it to set at room temperature or put the cake in the refrigerator for 20 minutes. melt the chocolate and drizzle over the cake. Recipe adapted from this Family Circle recipe. Welcome back to #BundtaMonth, a monthly celebration of all things Bundt hosted by Cake Duchess and Baker Street. 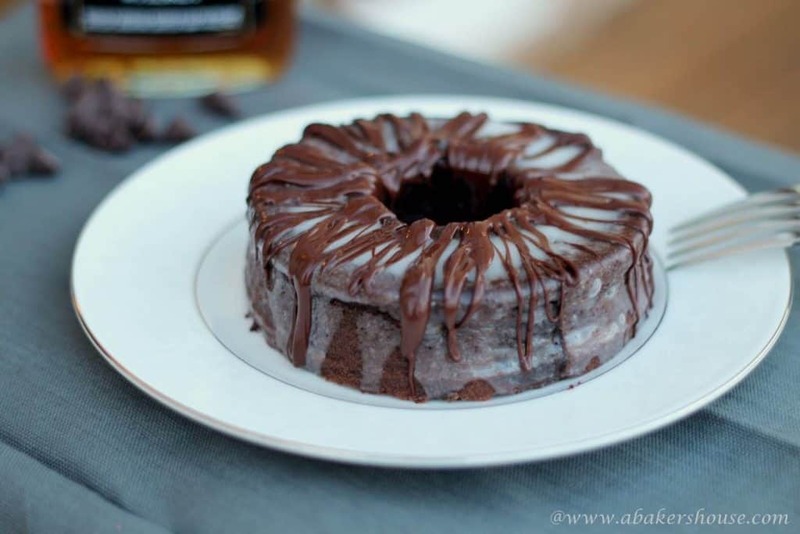 I am happy to join this group with my contribution for the December theme of boozy cakes: the chocolate bourbon mini Bundt. Need some more inspiration? Check out these beautiful Bundts! This bundt looks fantastic! I love chocolate and bourbon together. Heck, I love bourbon. Pinned. Thanks, Jennie! Yup, you can’t go wrong: it’s hard to say which is the highlight of this cake– both the chocolate and the bourbon were great. Thanks, Alice, I just drooled over your beautiful cakes. I am looking forward to next month’s Bundts already. I would be very happy with little fudgy chocolate cakes like these. I might would have to keep them for myself. It’s okay not to share right? You are right, sharing is over-rated!! I did eat one myself and have two more ready to go for truffles. Perfect for a holiday party or hostess gift. You must know I’m a big believer in learning how to punt when it comes to cooking…you quite obviously did just that and won the game today! Looks gorgeous. And I’m sitting down now with the cookies you gave me; just perfect for a short break. YUM! 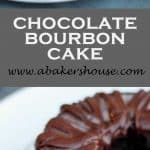 A fudgy cake made with bourbon?! Swoon! Yes, you can’t go wrong with chocolate, espresso and bourbon! That’s hysterical! And I love that it came out! Awesome! Well this wasn’t my first near flop in the kitchen and it surely won’t be my last– I love when I make delicious mistakes!! I love that things worked out alright 🙂 I also like the sound of a dense, fudgy bundt cake. Lovely job! Thanks, Kate! I will have to give the “real” recipe a try too as the photo in the magazine looked great. For now, I’ll be happy with my fudgy cakes! Thanks, Lora! Another great month of Bundts. I have enjoyed reading through all of the posts today and look forward to the others that link up. Thanks for hosting. YUMMY, all I need is a tall glass of milk and I will be in heaven! Thanks for sharing! Thanks, Pamela! I always appreciate your kind words. Hope your craft show went well today. Let me know! Thanks, Paula! I think bourbon- fudge might be a new flavor that I try to make as gifts this Christmas. Last year’s fudge would be blown away by the addition of bourbon for sure. This one is on my list since chocolate and bourbon and coffee are best friends! I love that you glazed it and THEN drizzled it in melted chocolate. Going over the top for #BundtaMonth! Oh, yeah! Boy have I done that (when adjusting ingredients) However, I don’t think I was ever able to fix it as good as you. Anyway, this little bunt sounds fabulous. I’ve used espresso in a chocolate cake before and loved the combination. How good does this look?! So glad that it worked out in the end with such great results. I sure wish I had a piece with my morning coffee. Bourbon and chocolate…. oh yeah!! 🙂 The cake looks wonderful! The photos are yummy! This is fabulous. You give good bundt! !